Thank you to Asim and Amrita for having me on the always excellent Khandaan Podcast to talk about Zero, the trailers of Manikarnika (this could be historical wackadoodle fun but probably won't be?) and The Legend of Maula Jatt (it's hard to think of an actor less evocative of Sultan Rahi than Fawad Khan? ), and our year-end choices. The episode is up now! We discuss Zero in depth, but if you want my quick take: days after seeing it, I still don't know what to make of it. I honestly don't think it's disastrous or without merit, but I don't get it, either. I'm not confident I can even guess what the makers are trying to do: show that physically atypical people and alcoholics can be just as awful as anyone else? As Amrita says on the podcast, Zero takes big swings, but it misses. On paper, this is a 1970s everything-but-the-kitchen-sink masala plot—space! baby! chimp! movie star! a bunch more movie stars! almost wedding! another almost wedding! narrator! big song in a hotel! charming moppets! hero whose attitude is fixated on the situation of his birth!—but the telling is missing the sense of fun and generosity that make those films work so well. I remain appreciative of Shah Rukh's experiments. His performances in them are strong even when the projects as a whole misfire. His best work in the last decade has been far outside what his contemporaries are doing or would dream of trying (Dear Zindagi, Fan), and his worst are the times he let himself be shoehorned back into a warped version of the romantic hero of a different era (When Harry Met Sejal, Dilwale). The kid who got his start in theater and tv keeps trying and will not be contained, and I love him for it. The podcast includes a discussion of what we think he should do next (other than continue with the stubble and wearing linen button-up shirts), and I'd love to read your thoughts on that in the comments here or on the podcast site. Here's how the year shakes out for the other films I saw. This is a tie among Hichki, Veere Di Wedding, and Manmarziyaan. Hichki is more predictable and formulaic, but it is just so thoughtfully executed by Rani, the kids, Neeraj Kabi, Hussain Dalal, Supriya and Sachin Pilgaonkar, and Siddharth P. Malhotra. The "teachers help kids grow; kids help teachers grow; access to education is a basic human right" plot is exactly my cup of tea, and it's a joy to see it done so well. Its challenge not to underestimate people who are different from you or who have less than you is crucial in our miserable modern world. Veere Di Wedding has higher, more thrilling highs than Hichki, but its lows are a problem. For all Shashanka Ghosh's film achieves without self-congratulation and how the women soar, it is grossly classist and puts people down. Manmarziyaan is perfect. I'm delighted to see Abhishek in a good role in a good movie after so, so, so long. I love films that let characters learn and change and grow, and this story not only gives such opportunities but underscores why they're important—without rushing to a false-ringing happy ending unsustainably stretched into the future. There's an immediacy here that is emotionally satisfying. Taapsee is also excellent in the short web film Nitishastra. I used to think the best choices for action women were Priyanka or, grudgingly, Katfish, but now I much prefer Taapsee (and I haven't even seen Naam Shabana). I have no criticism at all of Stree. It's a runner-up only because genuinely scary is not so much my bag. What satisfaction in seeing men fear the streets at night! The friends are funny, the stree is creepy, the legend intriguing. I'm so glad Raj and D. K. have a hit project; A Gentleman is one of my favorite films from 2017 and was IMO quite underappreciated. Shraddha is suitably inscrutable yet in control. 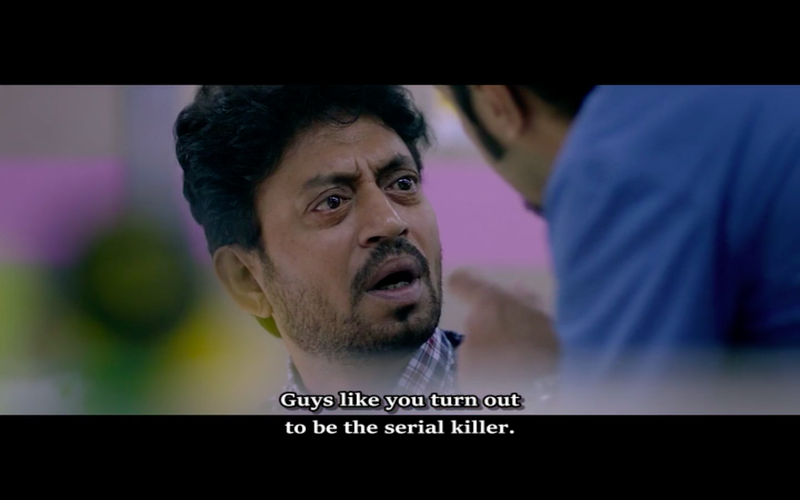 Rajkummar's turn reminds me a lot of his mild-mannered avatar in Bareilly Ki Barfi and Fanney Khan. As we discuss on Khandaan, I doubt the end of the Khans is exactly nigh, despite the odd year they've had, but I'm all for the rise of leading men who are more versatile than Salman, more productive than Aamir, and get themselves into overall better projects than Shah Rukh. There's a handful of films that I like fine but could have been better than they were. In the case of Blackmail and Kaalakaandi, part of what I like is that they exist at all. They're not the blackest of comedies, but they're darker than much of what Bollywood puts forward as comedy. If you like Delhi Belly, you'll probably like these. 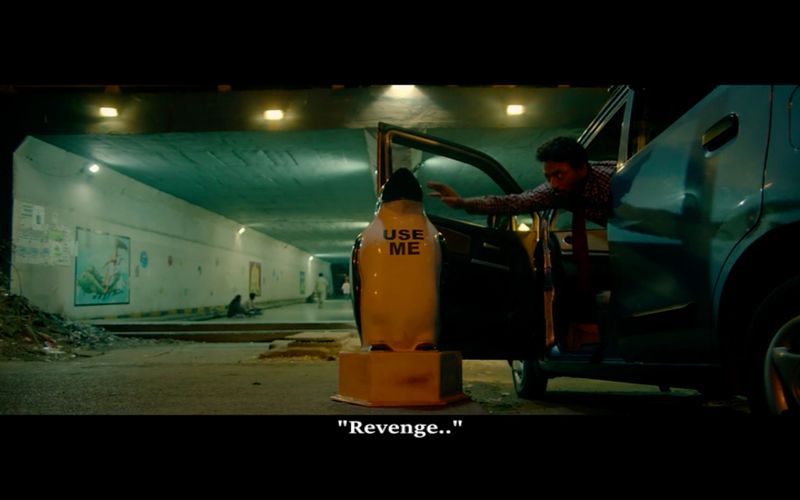 India's animal-shaped trashcans are a treasure, and they make a great motif throughout this film: questions of who uses whom, of being subject and object, of the garbage we put into other people's lives. And is there anyone better at phlegmatic disillusionment than Irrfan? This character isn't a hero, but he's not the worst; he's not completely resigned to accepting bad treatment of himself or others, but he's also not a superman who can fix it all by the end of the film. 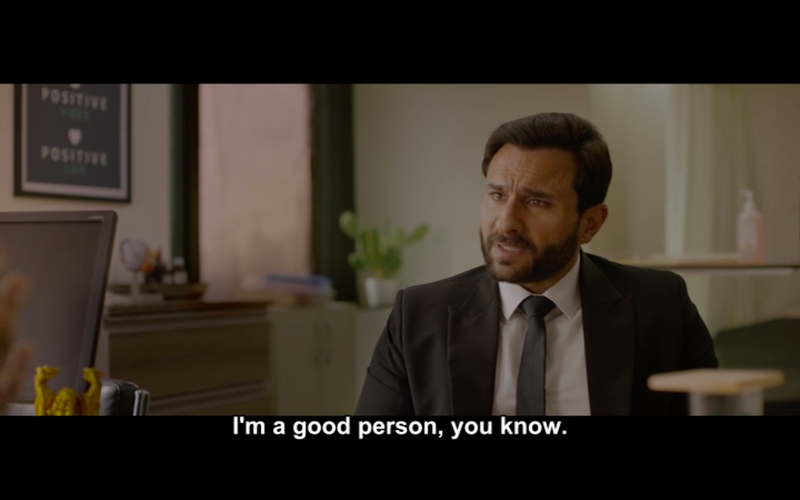 In Kaalakandi, Saif has social comfort but is terminally ill, and there's grit in the tension between all the "right" decisions he's made in a well-built (and firmly-founded) life up to the point the movie begins and all the chaos that follows. The poster behind him on the doctor's office wall talks about being positive. The film questions the value of linear time; characters are shown regretting decisions, missing or seizing opportunities, and in Saif's case regressing. There is a sequence of real vulnerability when characters escape backwards and then wish for an earlier era—one they weren't adults in, notably. The conversation is about Angoor, but note the Deewaar t-shirt. Not gonna lie, though: I'd be more impressed and they'd have more impact if these films had women protagonists, because it's almost always men who are given the freedom to go on sprees indulging wish fulfillment in unglamorous, societally non-conforming ways. (Remember how many people could not process Aiyyaa, largely unable to handle its subversion of gender norms in romance?) The women of Veere Di Wedding have the safety net and freedom enabled by money and status, which the lead of Blackmail does not and the lead of Kaalakandi has in lesser amounts, and their wildness and transgressions are relatively gender-specific and would just skate along with "boys will be boys" if they were male. Imagine a woman being depicted like this in a mainstream-y film. Raazi is also the opposite of what the trailer of Uri promises: a film unafraid to wonder about the ways war can corrode what we claim we fight for. This is regret, not victory. 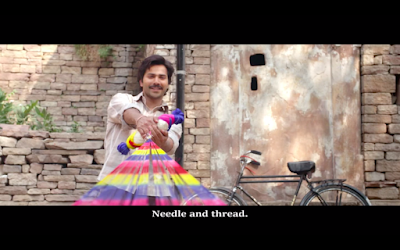 I talk about this a bit more on the podcast, so I'll be quick here: Sui Dhaaga is essentially a well-done, charming sports movie, but I need it to be a little longer so there is more buildup to their ultimate triumph, which itself is way too many leaps beyond where they started to make sense. The film loses me by overshooting when its vaults these adorable, skilled, valuable people from the place they started to national fashion design champions. I need more fabric (SORRY) to connect its worthy points of endurance, re-doing, mending, and creativity. Great performances, though. In addition to Zero, I have mixed feelings about some other films I saw this year. 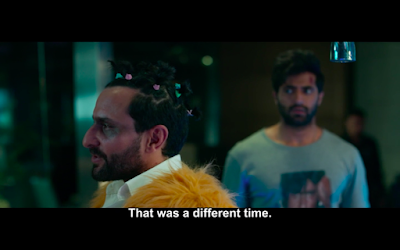 I really wanted to like October because I think Varun has more in him as an actor than he usually gets to use, but the swap of "comatose" for "manic" in the pixie dream girl trope makes a bad idea even worse. I haven't seen the Belgian original that Fanney Khan remakes (Everybody's Famous! ), but if the plot summary on Wikipedia is right, then the team of Fanney Khan makes some odd plot and tone changes that give them a much harder story to pull off. I feel for Anil's character, but his plan is so stupid (and truly criminal) that he doesn't really deserve to succeed. 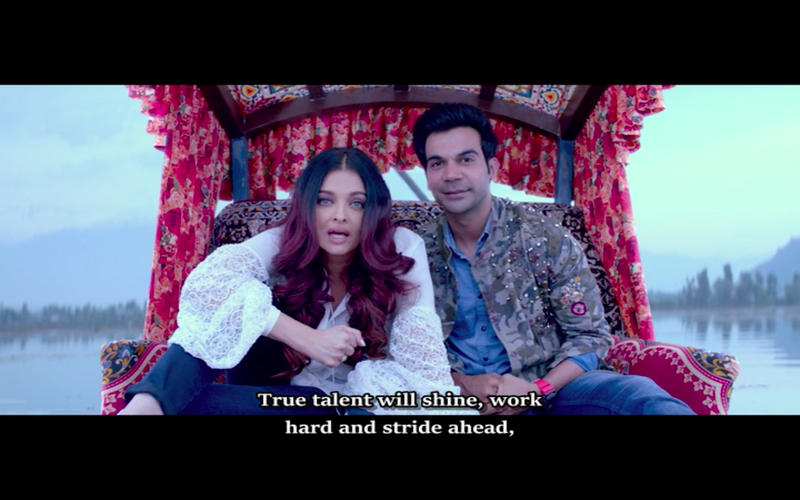 I do appreciate that Aishwarya's weary superstar is the actual voice of wisdom, reminding people that talent must be coupled with hard work and that your dreams may not suggest a direction that is meaningful for you. Race 3, Padmaavat, and Sanju. And for the record, I walked out of 2.0 after less than an hour. What else might I catch up on, other than Badhaai Ho? Bhavesh Joshi Superhero - It would have been more apt to call BJS 'Bhavesh Begins' because this vigilante hero origin story is a fitting companion piece to Chris Nolan's Batman Begins. BJS is notable for the grounded manner in which most of the action is set. The film is also to be praised for its non-stereotypic exploration of Mumbai and its surroundings, raising issues that mainstream cinema will not acknowledge. Slack editing, a half-baked romance angle and mostly cardboard villains bring down the experience, but the reasonably unique approach to the vigilante hero genre is worth a watch. Carbon - A gripping and visually ravishing tale of one man's obsessive quest for (fool's?) gold, evoking comparison to Herzog classics like Aguirre and Fitzcarraldo. Excellent direction and a strong lead performance from middle-of-the-road Malayalam cinema's hot favorite Fahadh Faasil. Damn, why couldn't this have come out on blu-ray? Manto - Biopic of author Sadat Hasan Manto. While the script does simplify the complexities of the author's personality and distill his life as a vehicle to discuss issues of religious hatred and censorship, Nawazuddin does an amazing job as the flawed and tormented writer and Rasika Duggal who played Manto's wife Safia is wonderful. Lots of great cameos from seasoned actors. 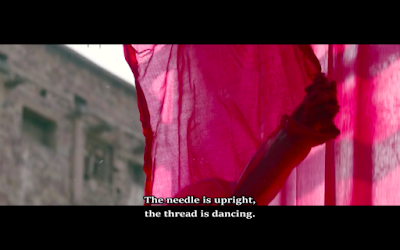 Tumbbad - IMO the best Indian horror movie ever, with a strong script and incredibly good shadowy visuals and great sound design. Focused direction and a defining performance from Sohum Shah (who also produced the film and stayed committed to its making over a period of several years). Also excellent staged CGI for the budget.